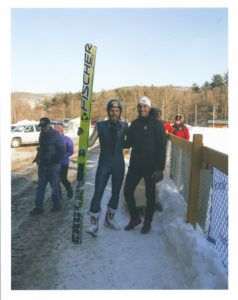 Skiers Chris Lamb & Spencer Knickerbocker at Harris Hill. This weekend, Harris Hill Ski Jump attendees can add an audio dimension to their experience by stopping by the Brattleboro Words Project’s tent to listen in situ to an evocative memoir, “On the Hill,” by jumper Christopher Lamb. The memoir and a short history piece are also available to listen to ahead of time at the Project’s Harris Hill page here. The Harris Hill site will be a stop on the Brattleboro Words Trail — self-guided audio walking, biking and driving tours beginning in Brattleboro. “On the Hill” was produced by Brattleboro Words Project’s Reg Martell with music by Ty Gibbons. “The History of the Harris Hill Ski Jump” was produced by Sally Seymour, a Harris Hill volunteer. Including the site on the Words Trail means anyone who finds themselves at the site can experience a bit of what it’s like to be part of the crowd on a cold February day when jumpers from all around the world gather for this thrilling annual spectacle so ingrained in the Brattleboro sensibility.” For more information on Harris Hill, visit harrishillskijump.com. The Brattleboro Words Project is a multi-year collaboration between the Brattleboro Historical Society, the Brattleboro Literary Festival, Write Action, Brooks Memorial Library and Marlboro College and is backed by a National Endowment for the Humanities matching grant. The Project seeks public participation in researching, writing and creating the ‘Brattleboro Words Trail,’ audio linked to sites of interest in the history of words for walking, biking and driving tours, a book on Brattleboro’s printing and publishing history, and other events linked to the October Brattleboro Literary Festival and throughout the year. For more information visit www.brattleborowords.org.